Patrick makes it super easy for anyone to learn math through a collection of useful video lessons. Patrick has been teaching math for 8 years at the university level. 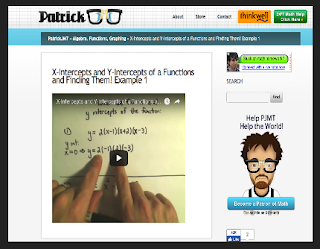 His website, Patrick JMT offers tone of free video tutorials covering a wide variety of mathematical topics that include Calculus, Arithmetic, Algebra, Trigonometry and many more. Use the search box in the website to search for specific math videos or you can scroll down and browse through the collection of videos in the homepage. Once you find the video you want click on it’s title and you will be directed to a page where you can watch it. Resources offered by Patrick are totally free of charge. No registration is required. You may want to spend sometime going through his website and see if you find any video tutorials to use with your students in class.